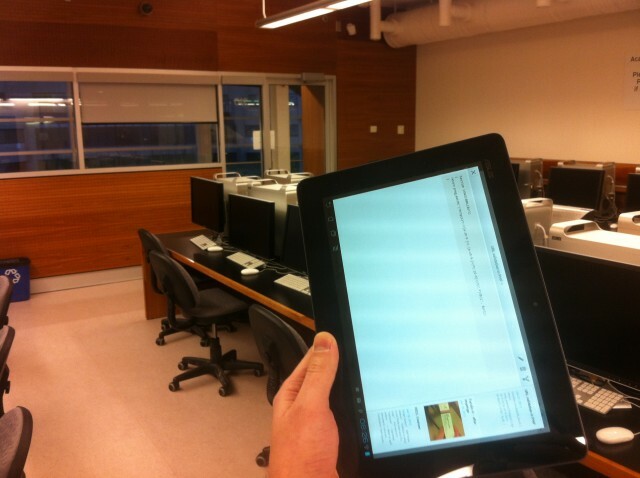 During my four weeks of teaching in January I’ve been teaching with a tablet: the Asus Transformer Prime. When I teach I almost always have a digital device (beyond the presentation tool) with me to reference my notes and do all the digital teaching elements like recording marks and interacting with students digitally. So far I’ve found my laptop to do all I need it to, but laptops have a limited battery, they can be less than portable and have the visual barrier of a vertical screen. My phones, specifically my iPhone, is too small to refer to and interact with while teaching. I like the form factor – back to when all I’d use was paper notes…. well someone else teaching a class would have. The portability does allow me to be more engaged with my students both with with my location in the classroom and the removal of the laptop/monitor barrier. When I refer to my tablet for something I feel like Moses reading a decree from his tablet. I feel as though each fact should be prefaced with “thou shalt..”. Perhaps its the read-only or consumptive not creative nature of the whole tablet form factor that makes my notes read or feel like decrees? You are currently browsing the iMatt :: The Blog of Matt Clare weblog archives for February, 2012 .